After spending days, weeks, months together with him 24/7, all Elisha wants is to be like his mentor—only more so. What a tribute to Elijah! Would people say that about you or me after spending hours, days, weeks with us? Of course Elisha's request is rooted in spiritual desire. For I believe he sees in Elijah more than a magnetic personality, unusual insight, or signs-and-wonders power. He recognizes that the spirit of Yahweh is in him, working through his teacher and that's what he really wants. Expressions of spiritual desire are found all through the Bible. Solomon asked for wisdom and knowledge to rule the people well - 2 Chronicles 1:10. Israel is described as seeking God with all their hearts at a time of revival in 2 Chronicles 15:15. The psalmist talked about living full-time in God's house, admiring HIs beauty, and inquiring in His temple - Psalm 27:4. Isaiah spoke of longing for God during the night and seeking Him early as a means to putting the land he loves right - Isaiah 26:9. Jesus talked about our hunger and thirst for righteousness as a condition for blessing - Luke 6:21. Peter likened our spiritual appetite for the word to a newborn baby's craving for milk - 1 Peter 2:2. If you could ask for a double portion of the spirit of some Bible character in whom you see genuine spiritual desire, who would you choose? 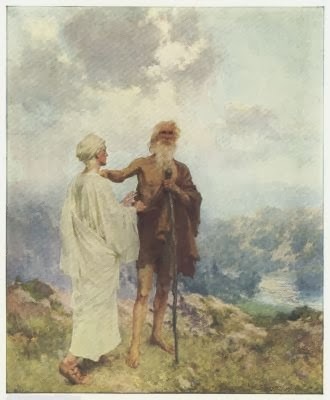 Perhaps Moses of whom it was said, "So the Lord spoke to Moses face to face, as a man speaks to his friend" - Exodus 33:11. Perhaps Joshua who faithfully led Israel first as Moses' understudy, then as its leader for generations, and who said: "As for me and my house, we will serve the Lord" - Joshua 24:15. Perhaps you'd want to be like Peter and John, of whom the religious leaders noted "Now when they saw the boldness of Peter and John … They realized the had been with Jesus"- Acts 4:13. PRAYER: Dear God, help me to see these Bible characters as examples and models of what you can do through me as I give myself to You and Your indwelling Spirit. Amen.